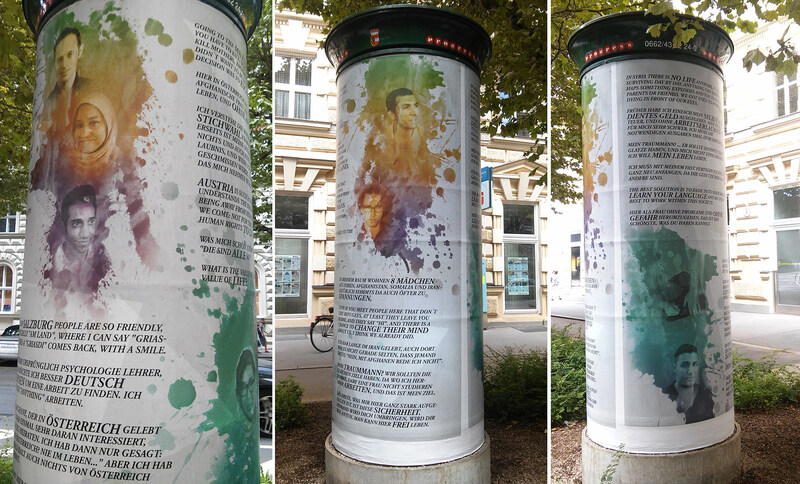 In August, on the streetcorner Rainerstraße - Franz Josef Straße in Salzburg, Reinhold´s Work that was chosen in the context of the "Art Advertising Pillar"-Call can be watched and read. It is based on the idea that these usually commercially used City Areas could also be used for telling stories. In this particular case Reinhold tried to interview 9 Refugees, that live in Austria, and let them tell their stories about their past, their here and now and their possible future. Thanks to the Interview-Partners and Helping-Hands: Abdullah, Arian, Hasan Omar, Imad Osman, Khadija, Masoud, Mawiad, Parwisz, Shakiba and Wahid.